While serving in Baghdad, First Sergeant William von Zehle did a little car shopping. Like any enthusiast overseas he was mostly interested in cars that never appeared stateside. 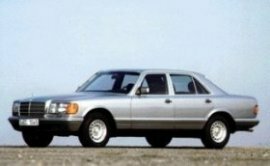 One model he found, just happened to be an armored, 1988 Mercedes 560 (similar to the one pictured). A quick investigative mission revealed the car was one of several delivered to the Iraqi government (i.e., some guy name a' Saddam). Zehle picked it up and shipped it back to his home in Connecticut, where the side-mounted flame-throwers (for crowd control, natch) won't likely meet DOT regulations. He says it needs some work, but he'll have those crowd control devices ready for rush hour soon enough.